If you’re like a lot of marketers promoting content on social media, you’re spending several hours a week composing blurbs and scheduling posts. And with all that effort, a lot of your content still goes unseen by your target audience. What if you could spend an hour setting up your social media schedule – and not have to think about it again for the rest of the week? What if you could be sure your social media content well never runs dry, and that your content gets shown more than once, to different sets of viewers at a time, so that more people see it? 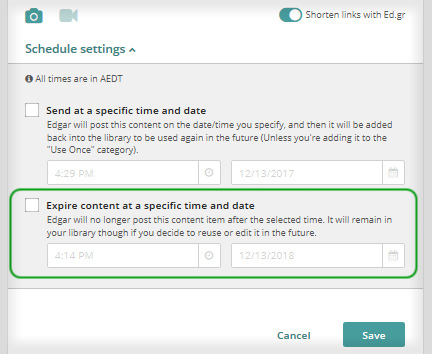 MeetEdgar does what most social media scheduling tools do – lets you schedule posts on popular social media platforms for various times in the day. 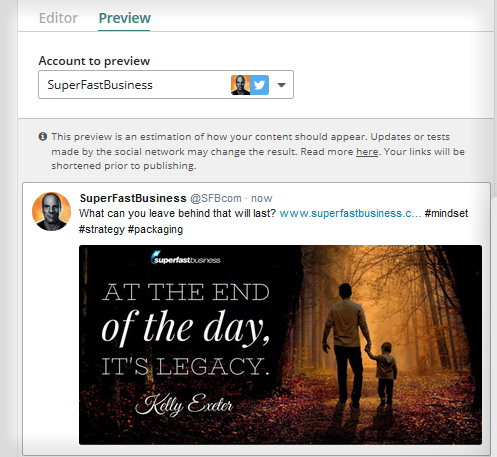 What it does differently is it lets you categorize your posts, so that you always have the right mix of content being promoted. And after posting it for you, Edgar saves your content, to be re-posted when you run out of new stuff. This exposes your material to a new set of viewers and ensures your social media accounts never go quiet. 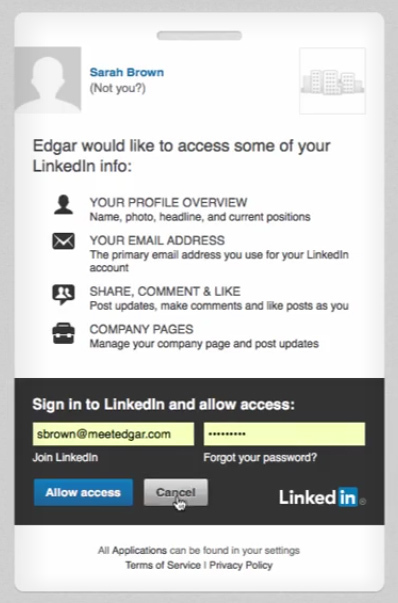 For Twitter & LinkedIn, Edgar will need authority to access your account. 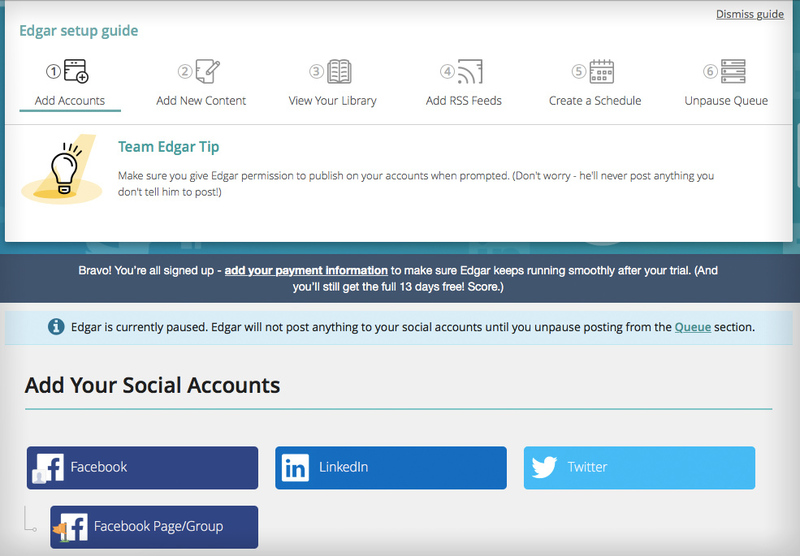 For Facebook, grant Edgar permission to both post for you and to manage your pages and groups. 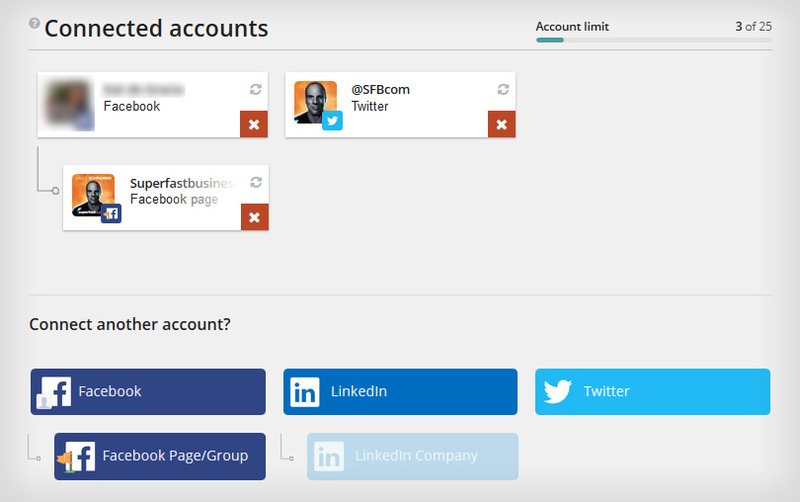 Set the app visibility to Public to be sure your followers can see your posts. The next step is building a library of your content from which Edgar can draw material to post. 1. You can start by creating your categories. 2. 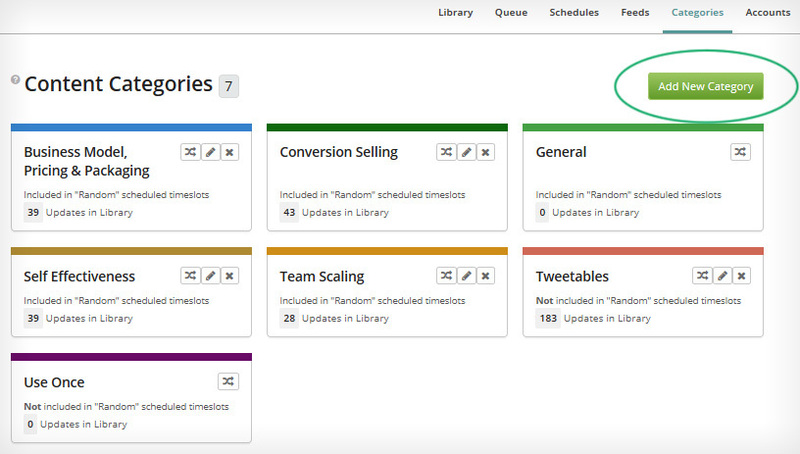 You can then build your library one piece of content at a time, or import in bulk from a CSV file. c. You can add an image or video. d. Choose the account(s) you’d like to post to. e. Preview to see what the post will look like. f. And save it to your library. 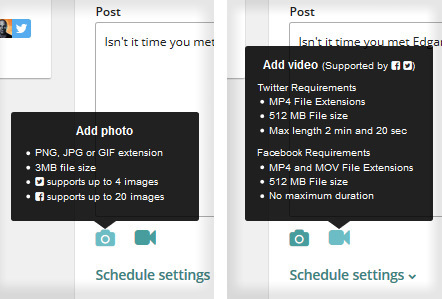 g. By choosing Edit, you can specify the time and date you’d like to post. Detailed instructions for creating a CSV of your content and importing in bulk are available here. You can also add new content to your library via an RSS feed. If you didn’t add a feed during setup, you can do so via the Add Feed option under the Feeds tab. Edgar checks feeds for new content once in 24 hours. 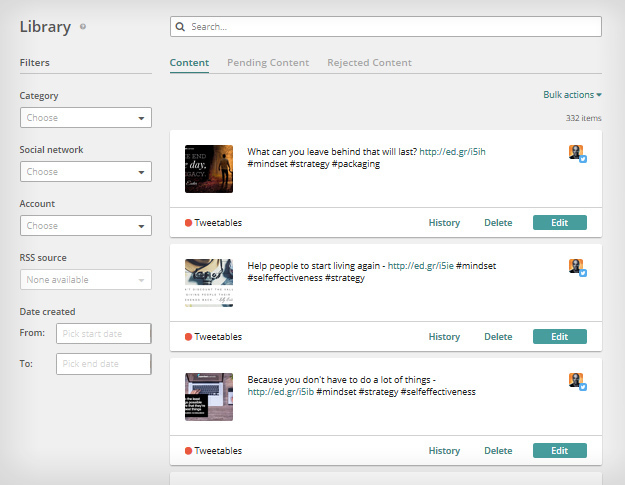 You can have him import feed content directly to your library or to your Pending Content queue where you can review and edit it before adding to your stock of posts. 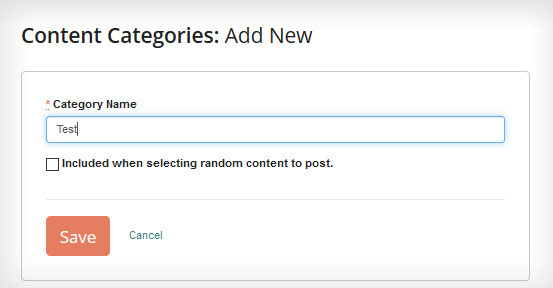 You can also edit the category and account(s) associated with the feed. 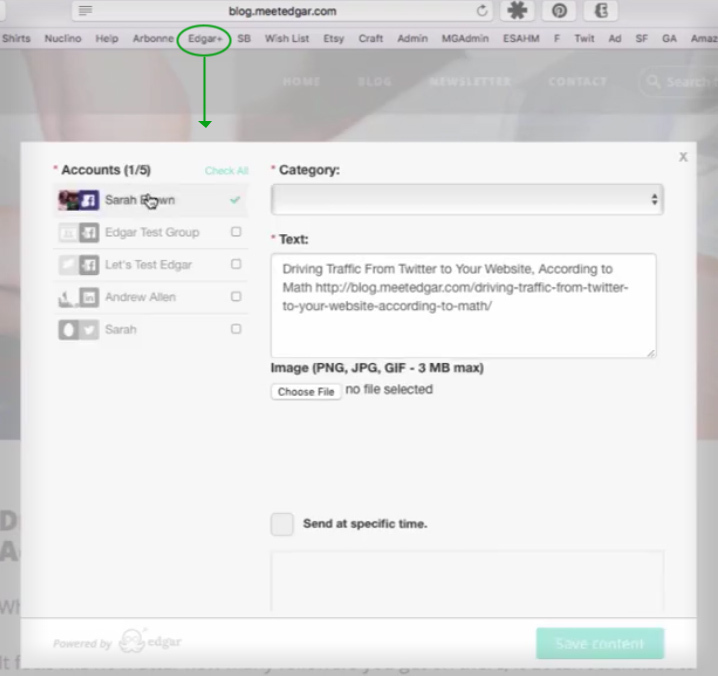 Via the above methods, you can add an unlimited amount of content to your MeetEdgar library. 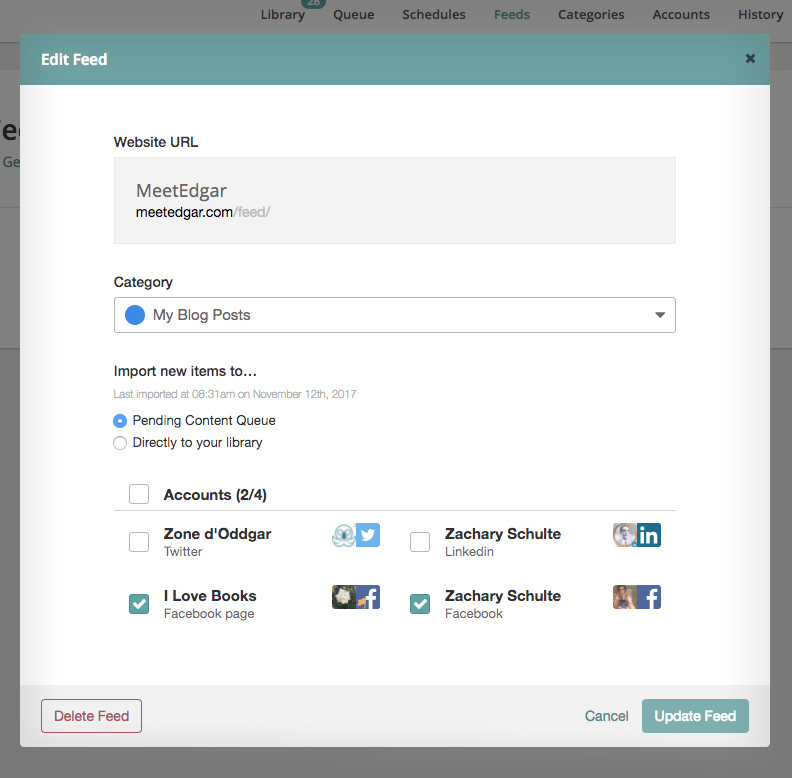 Adding content to your library is the initial, most labor-intensive part of using MeetEdgar. However, once you have your content set up, Edgar can draw from your store of posts and update your social media accounts indefinitely, with you needing only to tweak your scheduling and add new content as you please. 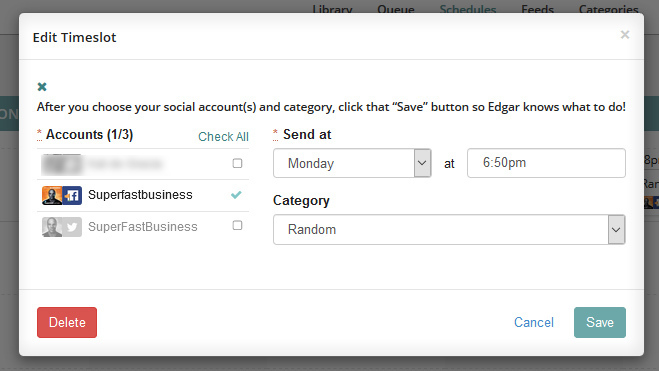 When you have your library stocked with content, you can create a schedule for your posts. A click will let you add a timeslot. 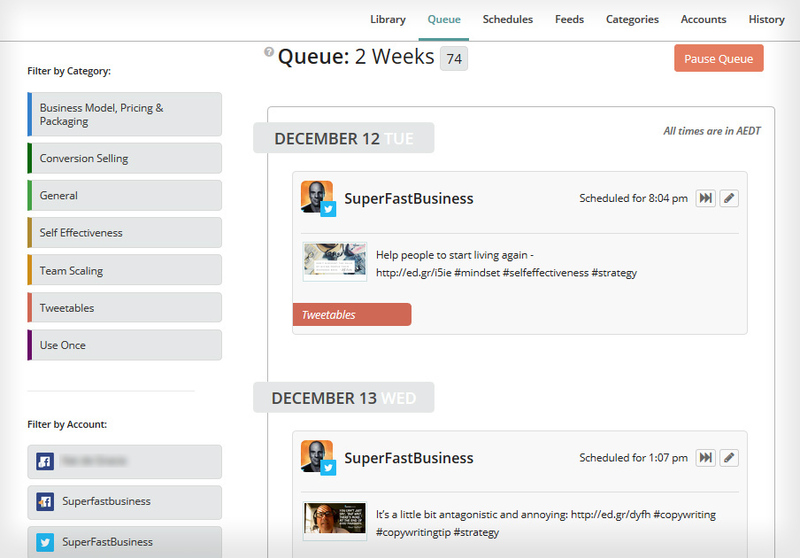 You can have a maximum of 1,000 time slots in your schedule. Clicking on a timeslot will allow you to edit it. The queue is where Edgar displays the updates that are due to be posted – both those Edgar has drawn from your library and ones that you have manually scheduled. The queue lets you view two weeks’ worth of posts, but you can schedule out further than that and the scheduled posts will be added to the queue. From the queue, you can choose to Skip or Edit a post. Edgar posts in a last in, first out order, so he won’t repost an item until every other post in the same category has been used. The exception is Random timeslots. 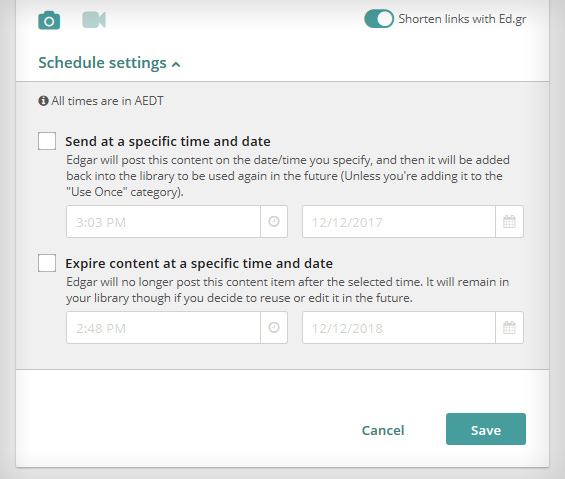 If a timeslot is set to Random, Edgar mixes all your content into a random order and then cycles through it. 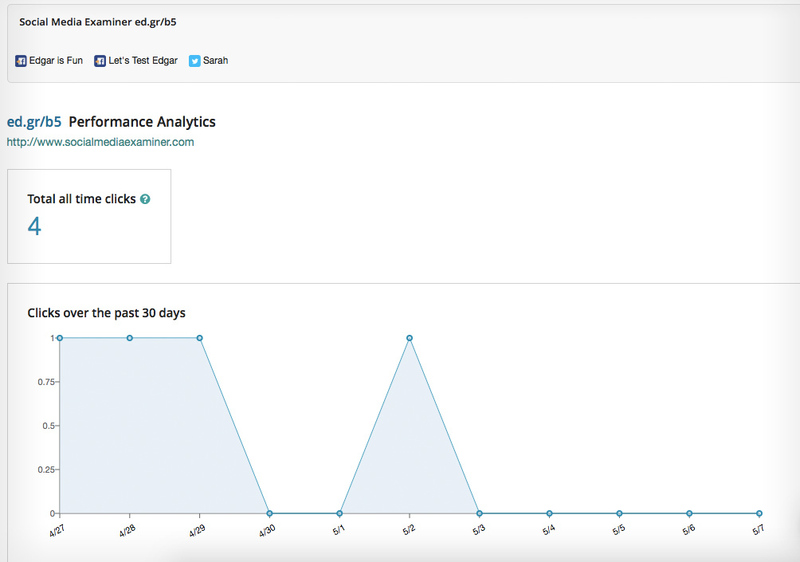 URL shorteners and in-app click tracking let you know when your links are clicked. 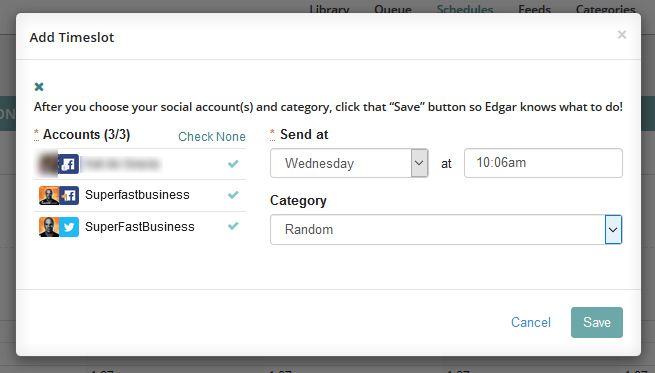 The Edgar browser extension allows you to add content from your blog or any other site on Chrome, Safari or Firefox. Auto-expiring content lets you have seasonal promotions that expire at the time and date of your choosing. 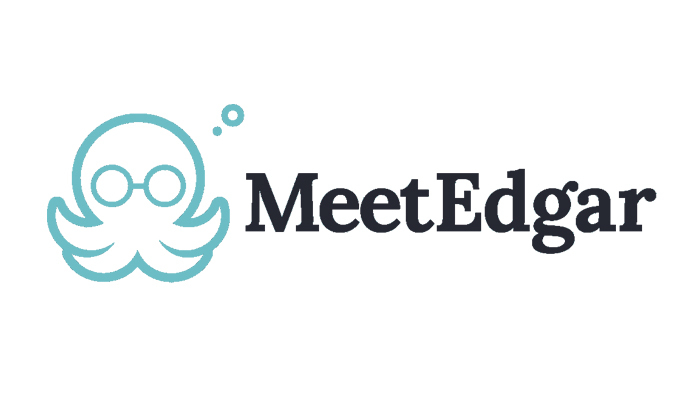 MeetEdgar currently offers a monthly plan at $49 a month. Sign up for their yearly plan at $539 per year and you save a whole month’s fee. What’s more, they offer a non-profit and military (active duty, guard/reserve, spouses, and veterans) discount on their annual plan, lowering it to $392/year. MeetEdgar has made our social media marketing easier than we could have imagined, and it can do the same for you. You have a large amount of content that not enough people are seeing. You’re spending hours each week on your social media marketing. You’re putting a lot of effort into reposting your evergreen content on social media. You’d like to give new life to your older content posts. You want to boost the flow of traffic to your content via social media channels, without paying for ads or buying followers. Ready to meet Edgar? Sign up now and watch your social marketing take off!